The Florida Fish and Wildlife Commission have temporarily halted its aquatic herbicide spraying program after people in the community say it's harmful to the lake and marine life. 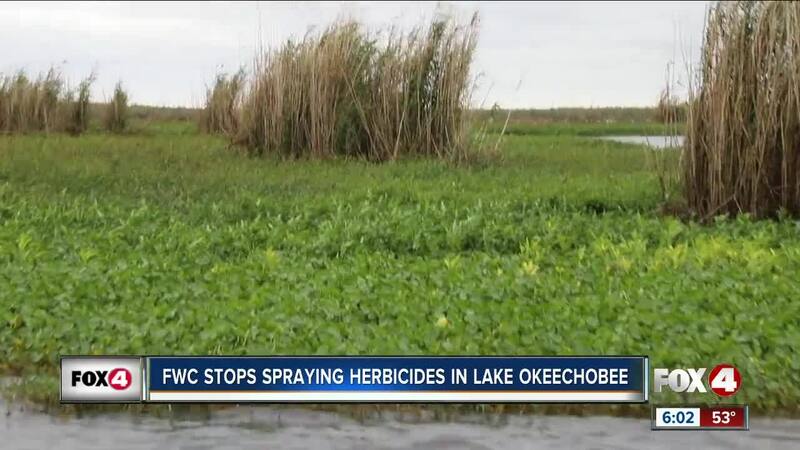 CLEWISTON, Fla. — CLEWISTON, Fla. -- As of January 28th the Florida Fish and Wildlife Commission temporarily halted spraying herbicides on Lake Okeechobee. “It’s the liquid heart of the Everglades if we don’t keep Lake Okeechobee healthy nothing else is going to be,” said Ramon Iglesias, General Manager, Roland Martin Marina . Raymond Iglesias has been fighting for this since April 2017. “Any angler that has fished any lake in Florida is jumping up for joy,” said Ramon Iglesias. Two invasive plants FWC spray for are water lettuce and hyacinth. Raymond says when it dies it sinks to the bottom of the lake and causing the floor of the lake to have excess sediment, which impacts fish habitat. “When you spray and the plants start decomposing it will cause the oxygen level to go to zero and the fish will have to evacuate depending upon how many acres you spray that may be a big concern,” said Dr. Paul Gray, Audubon of Florida. Dr. Gray says sometimes when FWC spray it's killing off native places that are beneficial to the lake and wildlife. But he doesn't think the chemicals are directly related to algal blooms. “Net nutrient balance of the lake and net nutrient availability to algae I don’t think it’s much of an effect,” said Gray. The spraying has stopped not only on Lake Okeechobee but all the bodies of water across the state. Public meetings will be held to discuss solutions. “Mechanical harvest, it’s a better way of doing it, it’ll help improve our fish habitat our bird habitat,” said Iglesias. “I think FWC needs to be more rigorous in the description of what they are doing and why they are doing it and back it up with scientific support,” said Gray. “We are all fighting the same fight, instead of eradicating the plants, we need to eradicate spraying,” said Iglesias. You can email your suggestions to InvasivePlants@MyFWC.com. No dates have for the meetings have been set.